Solids: How to Start?. How to start feeding your baby solid foods. Tips for success in feeding your baby solid foods. Eating should be easy. 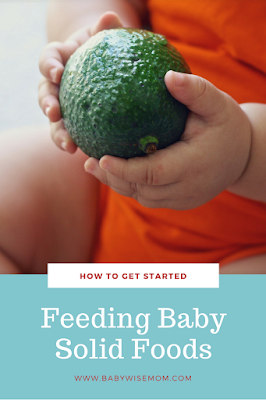 The idea of feeding a baby, before you have ever fed a baby, seems simple enough. Baby is hungry. You offer baby the food of the moment, baby eats, and baby is full. Then you try to feed a real baby. The real baby might not be a great nurser or might be picky about the bottle. By the time you get any of that figured out, it is time to start feeding solid foods, and it isn’t as easy as it seems like it should be. There are so many possibilities. This post contains affiliate links. I follow Baby Wise Book 2 pretty closely in starting solids (found on page 45). I basically do it by the book. But the book says they are only guidelines, not rules, so you don’t risk ruining any Baby Wise Book 2 schedule by doing it your own way. Just be sure to feed solids at the same meal you feed liquid (so you don’t start snacking) and you will be fine. When I start, I breast feed from one side, then feed the solids, then breast feed the other side. Inconvenient? Absolutely! It really helps get the baby going on solids, though. After the baby gets the hang of it, I go back to full nursing before the solids. If you bottle feed, do half of the bottle, solids, then the other half. While I am feeding the one side, I pump milk from the other. I did it in the morning and pumped all I wanted for the day–that way I only had to pump once. I then used that to mix with cereal. I think it makes sense to introduce foods as early in the day as possible because you then have all day to look for possible allergy signs rather than them occurring at night; however, with Kaitlyn I started at her 7 PM feeding because it worked best for me–my husband was home at that time and therefore could watch Brayden. At first I just did 1/2 T per meal of rice. Then each day I would increase it by 1/2 T. So day 2 was 1 T, day 3 was 1.5 T, etc. Then I stopped where I could see she didn’t want any more rice than that at a meal. I mix the BM and rice at 1 to 1. Once ounce of BM and 1 T of rice. You have to watch the baby and see what he prefers. Kaitlyn liked hers runnier. Brayden did not care about the consistency, he just wanted it in his mouth! I do this for one week (one meal a day for one week). Week two, you do cereal at breakfast, lunch, and dinner. You gradually increase cereal amount to 5-8 T, though I remember sometimes Brayden ate more than 12 T during one meal! Two weeks later, you start veggies. BW suggests you start with the noon meal and to start with yellow veggies (squash, carrots). Introduce the yellow veggies in the order you want to. Most babies LOVE sweet potatoes. You can either start with those for that reason to give baby a good experience, or end with those for that reason so baby doesn’t refuse other ones. Depends on the baby. Two weeks after starting yellow veggies, start with the green. Wait two days between each new green veggie. Fruits! Funny to say, but true, both of my kids HATED fruit at first. Brayden quickly became okay with it, but at 8.5 months Kaitlyn still only tolerates it. There are some fruits she kind of likes, but it all depends on how hungry she is. I think fruit on a whole is tart as a baby food because it, of course, has no added sugar. Wait a couple of days between each new fruit. You can add fruit to cereal if you want. I didn’t with Brayden because he LOVED cereal and seemed to like the flavor of it alone best. I do with Kaitlyn because she eats more fruit that way. I would stay in a food group. For example, if you want to start fruits first, introduce the fruits you want to (waiting two days between each new fruit) and then wait two weeks before you start veggies. I would then do just one color of veggie at a time, waiting two weeks before the next color. If you want to mix it up (fruits, veggies, fruits, etc. ), I would wait more days between each new food. So if you had done bananas, I would then wait at least 5 days before you tried something like sweet potatoes. The benefits of sticking to a food group are for the digestive system and also allergy watch. Think it through and decide what is best for you and your baby. What Age Should You Start Feeding Solid Foods to Babies? I started my 6.5 month LO with solids almost 3 weeks ago. We started with rice cereal once a day as BW recommends. Two weeks later I have yet to get any appreciable rice cereal in her. She clearly closes her mouth when the spoon with cereal gets close enough to get in–she will open it for anything else ( a toy etc). I just kept trying not pushing it too hard thinking she would eventually become ready, but she has never accepted the rice cereal on purpose. I finally changed to sweet potatoes a couple of days ago and she is now opening her mouth a little for those, I’d guess she’s only taking about 1 tablespoon before she’s done. Do you think she’s just not ready? She’s sitting up and seems really interested until she tastes things! The one thing I have not tried consistently is BF her on one side then solids, then BF her on the other side. Interestingly, the only times I have gotten her to open her mouth consistently is when she’s holding onto my hand to bring it to her mouth with the spoon–she won’t let me do it! Any ideas or suggestions? Ok so I have another question regarding solids…I will be heading to the store today or tomorrow to go buy veggies but I have no idea how much to buy. I know you only start them on a couple of T for the first couple of days. What I don’t know is how often he should eat them and how much to expect him to eat each time I feed them to him. (keep in mind I have a hungry boy on my hands). So what do you think? I plan on using Gerber Organics that come in the little tubs (2 to a package) so I guess my question is how long should I expect those to last? One per meal?BTW…I just want to say “thank you” so much for all the advice! Someone should write a book on these general things because nobody really just covers the basics…it is like we are just supposed to know! When you are initially starting, you only want to give a couple of T so you can watch for allergies. If he loves them, then the next day you could be feeding close to one per meal, but it also might take him time to work up to that. They can last 1-3? days in the fridge. It says on the container.I always plan on one per meal when I am buying. My daughter rarely eats one fruit per meal, but I still buy enough for it. Then the next time I buy, I subtract what she still has in the pantry from the number to buy.They last a long time, so as long as you can afford it, it doesn’t hurt to buy more than you think you will need. Good luck!I am happy to help!A book you might like is Super Baby Food. I haven’t ever read it, but I have heard great things about it from a variety of different people. It covers food from birth to three years old. I am having the same problem with my LO. Today I had to give him babylax for the 2nd time in a month (dr. recommended). So far she has not mentioned stopping cereal, though, but I know it is the cause. I’m hoping adding veggies will help? I do give him some apple juice to try and help and will probably do prune juice eventually. When you introduce fruits, those should help most. Prunes, apples, and pears all help things. Another thought, this can make a good point about you doing what is best for your baby. If your baby is having a hard time with bowel movements, perhaps you will want to introduce a fruit or two before veggies. For example, when it comes time to introduce veggies, you might introduce prunes first. That way, you could mix prunes with cereal from that point forward. You could do prunes, wait 4 days, then start veggies. When you mix fruit with cereal, how much fruit do you mix in? I usually make 4T cereal mixed with 4T formula. That will depend on how much your LO likes fruit. When you first introduce it, I would do it straight. If he hates it, you don’t want the cereal to be full of the stuff. Or if you really don’t mind possibly wasting it, mix a spoonful with your cereal at first. He will be more likely to like it if it is muted with the cereal flavor.Kaitlyn doesn’t really like fruit, so I do 4 T of cereal with 4 scoops with a baby spoon of fruit. If it has more fruit flavor than that, she won’t eat the cereal. If it is a cereal flavor she tolerates, I will sneak more in there.Just be sure you don’t start with more than 1T in case of an allergy. Valerie, I just started rice cereal yesterday with my 4 1/2 month old. I’m following your advice, nurse, solids, nurse and doing it just once a day for this week. My question is how runny should rice cereal be? I thought I read on your blog that you did a 1:1 ratio with 1 ounce of BM to 1 T cereal. I did that and it seemed quite runny. Should it be thick enough to coat the back of a spoon? Also, when trialing solids, did you have your babies try to eat all of the cereal you mixed for them or just kinda play with it in their mouths for the first week? I don’t think he’s getting any nutrition out of it this week since it’s so new to him. Did you notice by week two, they will get it like BW II says??Thanks!!!! Yes, at first it is really, really runny. At first, Kaitlyn just ate about a bite at a time. Brayden eagerly at it all, but he was asking for solids at 2 months, so he was ridiculously ready mentally. Kaitlyn took a while to increase the amount of food she ate. She slowly worked it up. I think you will start to see improvement in week two, but not necessarily as good as you think it should be. It takes time to get used to it. Some get it faster than others. My son (5 months) BF for only about 5 minutes on one side and when he is done he is DONE. I have tried BF then feeding cereal but he is not really interested in the cereal after BF. If I feed cereal first he will eat more but I never know how much to give him because if I feed him too much then he won’t nurse after. Any ideas? If they are still nursing a full nursing how are they hungry for solids at the same meal? I’ve never quite understood this! Thanks! If he won’t eat at all after nursing, I would feed him some solids before, but start small. 1 T or less at a time. At this point, it is more for practice than anything else. I have an additional question about the feeding outlined here. We are not supposed to have our daughter on cereal due to severe constipation. So we started her on sweet potatoes, which she LOVES. Then after 2-3 days we went to squash. She also loved that. We were told not to do too many of the yellow/orange foods at once due to the fact that she could turn orange. So I introduced green beans to her last night. She hated them and pretty much won’t even open her mouth to get any in at all. Do you have any advice for this type of problem? Also –when you say 5T of cereal. Do you mean tablespoons or teaspoons? Silly question, I know. But she hardly eats 1 jar a day – which I believe is 2 1/2 tablespoons. We were told that for her size (17 pounds and 27 inches long) she could be eating 2 JARS a day in addition to her 28-30 ounces of formula!!!!!! I am afraid she will lose weight. She is not eating as much now (due to teething, I suspect) and it is already concerning me. Do we offer her a spoon of the SP or squash and then one of the green bean, just to get them in there? Or will that turn her off of the others as well? HELP! T means tablespoon. When it comes to solids, I would let her set the pace. My two kids have always been pretty close to the same sizes at the same ages, but ate vastly different amounts of food. They know what they need. There are some babies that need to be slowed down and some that need to be coaxed. But since your daughter is just learning, I wouldn’t worry. It starts small and works up to the usual amount. Also, teething really does interefere with the amount of food they will eat. My daughter is 5 months and we are on our 6th day of cereal. I really can’t get her to eat much of it, but we are still going through the motions. I have also bought oatmeal and was thinking of starting that next. Do I just jump into it or do I need to wait a few days before starting? Also, when waiting between fruits or veggies, do I give her the food for a few days and than wait a few days before staring the next? Hope that my questions make sense. I would wait on the oatmeal, unless your pedi has okayed oatmeal for her age. It can be harder to digest so many suggest waiting until 6 months before introducing oatmeal.For introducing veggies, you would still give her the rice, then one day do, say, carrots at one meal. Just one meal at first. You then give carrots and rice each day. After a few days, you introduce sweet potatoes. She can still have carrots and rice and an added sweet potato. You know the carrots are safe for her, so if there is an allergic reaction you know which food is the culprit. I hope that was the question you were asking.Be sure to look through the many posts on solids. Becca, it is to prevent reactions to allergies and also to help the digestive system get used to a particular type of food. You can introduce foods in any way you want to–you can do a yellow then green then yellow veggie–but if you do, remember to do about 5 days between each new food rather than two days. This gives the body time to adjust and you time to watch for allergies.Also, the only yellow veggie that turns the baby orange (that I know of) is carrots. If you feed a ton of carrots, his skin will turn an orange tint–but it takes a lot of carrots for a lot of days. Thank you so much for this blog, it has been so helpful! I’m going to be starting my son on solids in a few weeks and I had a question about mixing breastmilk with cereal. At first, do you just use stored breastmilk? Or did you begin pumping the other side while nursing from the very start? If I nursed on one side, and pumped the other to mix with cereal, does this mean my baby won’t be feeding from the other side? Also, is it right to assume that the ounces of breastmilk consumed with the cereal will be taken from his regular feeding? Or are they in addition to what he typically eats? Right now my son drinks about 4-5 oz. of breastmilk. If I feed him 2 T. cereal with 2 oz. milk, does that mean he’ll only be eating 2-3 oz. breastmilk when he nurses? I hope this question makes sense. 🙂 Thank you! J9, I didn’t have any stored breastmilk, so I just pumped from the beginning. If you have it, you can use it. The downside to doing that, though, is that with solids he might nurse less, so your body would adjust and make less milk. If you pump, your body makes what it needs.Still nurse both sides. You don’t need to pump much. In fact, often I found just catching the let-down was as much as I needed.I am not sure about the ounces. I have never counted the ounces they drink while breastfeeding. I started pumping to also try to make sure I have enough milk and I have even fed my little one that pumped milk in addition to nursing at the last feeding because she doesn’t seem to get enough – that has worked but sometimes i forget to pump and is just inconvenient at times. (just discovered this in the last two days). Anways I know BW II says to feed solids the first 3 feedings and end with a liquid feeding but does anyone think it would be a problem to do the last feeding with solids because she already seems to not get enough with just nursing in the last feeding and thus wakes up during the night, this has been ongoing for two weeks. What can I do so she gets more to eat in that last feeding (and i have already been pumping to get my supply up)? I have a question about nursing and solids. Is there a reason why we should nurse first and then solids? I would think offering solids first will help with eating them. I tried nursing on one side and then solids and finishing with the other side but don´t have much success. Thank you. One reason is so your child won’t be so hungry he gets frustrated and won’t eat the solids. A big reason is because the milk is still of primary importance and you don’t want him to get overly full on solids and not take in the milk he needs.Some babies do better with solids first, so you can try it, but be ever mindful of your milk supply. Hi! I have a question about pumping for cereal. You said you use 1 oz to 1 T. and typically pump in the morning and have all you need for the day. You mentioned he ate 12 T one meal… did you really pump out 12 EXTRA oz in the morning??? Or even 8 extra? I really want to use BM (particularly since he didn’t like the taste of formula mixed with the cereal) but I am not sure how to keep up with him as he increases his intake. Thanks for your help! Thanks so much for this post! It's really helpful as a supplement to BW II. I was going to post a big, long question, but it's the same question as The Spanns' above…how much do you pump in the morning while starting on solids?? Thanks! Spanns, oh no! I only pump milk for the rice for the first little while of eating solids. I then move to water. I would never have the patience to pump 12 ounces! Sarah, I only pump a couple of ounces in the morning to cover the day while introducing. I then move to water after baby is eating well. This is usually within a month of starting. Dear Valerie, thank you so much for this blog. I discovered it about two months ago, and since then, it has been my main source for real-life, down-to-earth, practical, detailed, specific, and comprehensive information, as I raise my baby. You are amazing! and you are an inspiration. you have made me a better mother. I really appreciate you.My LO just turned 4 months and i am reading up on introducing solids, which I'd like to start doing sometime after the holidays. I understand that I have to BF AND feed solids at each feeding. At what point, a feeding is OK with just solids?the reason i ask is due to work situation. I would like to BF at 6am, 9am, 6pm, and 10pm DF. i would like to eventually substitute 12pm and 3pm feedings with just solids. i currently pump during these times, but it's becoming not possible.So am I thinking about this right? or will it always be that each feeding is a combination of BM and solids?Thank you so much!!!! Vita & Amp,It will be a long time before you do just solids…maybe never? I BF with solids until I wean at one year. Then I give milk with each meal. Brayden is 4.5 and still gets milk at each meal :)If you have feedings you don't watn to do BM, I would say you will need to do formula for those feedings. BM/Formula are the primary source of nutrients until at least six months. Some say 12. My son is 5 months and we just started on rice cereal. Today is the third day and he has been home for a long weekend. He will be back in daycare tomorrow and his normal bottles there are 10am, 1pm, 4pm. He has his first bottle at 7am before he leaves (well that is what i am aiming for). It is too dificult to feed him solids first thing in the morning and get our older son ready for school too. So I have given him cereal at about 8:30. How would you suggest going forth in daycare? Should I continue his breakfast at 8:30? Or should I have them feed him solids after his 10am feed? I'm confused!?! So far he hasn't really eaten too much but again we just started. Thank you in advance! I think I would stick with the solids at 8:30 since that is a natural breakfast time. Then I would do 1 and 4 as your schedule currently is. If he isn't home yet at 4 and you want to feed him solids for dinner yourself, then you can move that. Quick question. Once you are into the second week of rice cereal and are feeding 5-8 T each time are you still doing the same breastfeeding routine (nurse on one side, offer cereal, nurse on the other side)? What about once you introduce veggies/fruit? Does your breastfeeding routine change? With my first two, I did the nurse one side, solids, nurse the other side for about the first month. By the time we started veggies, we were nursing both sides.With my third, I just nursed both sides from the beginning. She still ate solids great, so I saw no need to split it up. Hi Val,Sorry for the long post, but I felt like I needed to give some detail……I feel like I’m in a bit of a pickle on the solids. My LO and I had a very hard time nursing b/w 2-4mo. He stopped gaining weight and started refusing to nurse – I’m convinced it was a combination of his reflux and my slow let down. Anyway, at 4mo we started trying to supplement with formula, but he refused so I began pumping and bottle-feeding. My milk supply dropped quite a bit and I could not keep up so we started solids (still kept trying formula and eventually he took it and that’s all he gets – my milk supply never picked back up). At the advice of my mother-in-law and sis-in-law we started giving him rice cereal and apples mixed together and he liked it. They also suggested that I add a veggie after a few days and alternate introducing a new fruit/new veggie. So, I have been giving him 1T cereal with 1oz formula (breakfast, lunch, dinner). In addition, I have been giving him 1 fruit with breakfast and 1 veggie with dinner. He is now 5mo and is eating 4-5 times a day b/w 6 and 8 oz of formula per feeding in addition to the food above (I think he’s trying to move to a 4hr. schedule, but not quite ready yet). I obviously have not read the second book in the BW series and was wondering what your thoughts are on where I am. Should I back up and go back to cereal only and get him eating more or should I slowly increase the cereal and focus on just fruits or just veggies in addition to the cereal? Oh, he has done well with apples, sweet potatoes, pears and we just started prunes today b/c he’s been constipated. Also, I know you said that you have to watch the baby on consistency of the cereal (Noah doesn’t seem to care except for the constipation), but how do you suggest gradually thickening the cereal? Thanks so much for all of your advice, I love this blog!!! Thanks Val,Just an update on how we're doing….we have cut out cereal pretty much. I usually give him a little bit in the morning. We have tried tons of different foods, all we have left to introduce are the green veggies. We are having a lot of fun and he loves to eat, which I am told is a blessing! Thanks again for your help! Hi there, Thank you so much for this blog. I have found it extremely helpful! My baby will be 4 months next week and I am getting ready to introduce cereal with BF at that time. I am still feeding 5 times per day and am wondering if the "dinner" cereal feeding should be the 5 pm feeding or the 7:30 which is right before bed time? A Better No Tomorrow,I have done it both ways. Either way works, but I think I prefer the 5 feeding. Thank you! We went with the 5 pm feeding and its working great. Also wondering if I can get your opinion on a sleep issue. I will admit, ive created some accidental parenting when it comes to naptime with my 4 month old. I started out holding him at naptime and putting him into the crib just as he started to doze off. This always worked so well so I just continued it. Now that he is 4 months old, Its not working as well anymore. I want/need to teach him to fall asleep on his own and assume CIO is the way to go. I would really appreciate any advise you may have. Thank you so much for your time! You can disregard my last question. We decided to try cio. On day 2 with huge improvement already! Thanks!!!! Glad you are seeing improvement! Hi Val!I read your blog quite often probably almost everyday. Thank you do much for your sacrifice and service to all moms! I'm a first time mom and Jordan is about to be 4.5 months. He's been sttn since week 9/10 consistently and just last week started waking randomly and at different times to eat! I know there are 4 month sleep problems for naps and we are defitiely there. He's been doing the chronic 45 minute naps for a couple weeks! 🙁 so I pump and bottle feed my BM and I usually always feed him in his room since we stuck a couch in there. So it seems like when starting solids you just stay in the dining area to feed. I feel like that's going to be very distracting and a huge change for Jordan. Did you have problems with feeding your children in the dining area rather than where you would usually feed them? Hi there! I'm on week 2 of solids with my 6 month old. His feedings are 6:45, 9:45, 12:45, 3:45, and 7:00pm. He drinks 7oz per bottle. I am wanting to do oatmeal at 6:45, 12:45, and 6:45pm. Do I just pour some formula from his 7oz bottles into the oatmeal so that he's not getting solids and 7oz? That is what I did for week one but in week two I'm going to start increasing the oatmeal which means I will need more liquid, but I don't want to take too much away from his bottles if that makes sense. Please Help!